You may be surprised to learn that the chiltepin is actually a pepper native to North America. Chiles grow wild in the southwest and Mexico, and are thought to be one of the oldest species of Capsicum peppers. The small round "berries" are slightly larger than peppercorns and are bright red or green in color. The plants are easy to grow, they are airy plants with spreading branches and tiny leaves. My parents used to grow this pepper on Guam and when I saw this plant at the Master Gardener Plant Sale, I snatched up the very last one. The food memory of this pepper is so strong I just had to grow it even though it is much too spicy for me. We used to pop the little pepper in bottles of vinegar then splash the spicy vinegar onto fried fish and meats. Nostalgia got the best of me with this impulse buy. Scoville heat units: 50,000 – 100,000. OUCH! The cayenne pepper is a hot pepper. It is generally rated at 30,000 to 50,000 Scoville units. There are many types of super hot chilies such as Thai chilis, Tabasco style chilis, the are all similar to the cayenne. It is a thin walled pepper with many seeds and is easy to dry. I personally freeze these peppers and take out scissors to snip small bits into the dishes I cook all winter long. I prefer to freeze them vs. drying them. Plants get 24-36 inches tall. I grew two plants this year and each plant has close to 100 peppers on them. 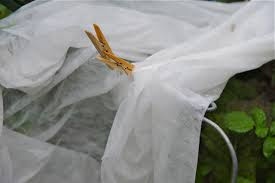 The plant is such a heavy producer than I recommend a tomato cage for support as well as keeping it well watered or mulched in the heat of the summer. Very easy to grow. Did you know that cayenne stimulates the production of saliva, an important key to excellent digestion and maintaining optimal oral health. * Note: With all peppers, plant outside when the weather is warm. 55 F in the evenings. I saw this pepper plant at the Master Gardener Plant Sale in May of 2016 and had to try it. It was a rare plant to the PNW and I had never heard of it before. I really enjoy growing new things so I picked one up. The plant is said to have a recessive gene for albinism and that is what causes the green and white striped leaves as well as the striped fruit. It is a gorgeous plant to look at, very ornamental and it does well in pots. The suggested use is in seafood dishes and it can be up to 10 times hotter than a jalapeno. Read more about the history of this pepper here. I have yet to try this unique pepper. Easy to grow, it is a tall plant about 24-36 inches tall and produces a very abundant crop. I ate the red pepper in the photo with my dinner, I got through about 3/4 of it before it got too hot for me. It has a nice floral aroma and is lightly sweet too. I first tried these peppers at a local sushi place in downtown Kirkland called Sushi Joa. They were roasted or grilled and slathered with a sauce that was sweet and savory. Since then I have gone back three times to eat the same dish. This is a trendy gourmet pepper that is popular with chefs. Shishito peppers have thin walls and it is reputed that 1 out of 10 is spicy. The rest of the 9 tend to be very mild. They are usually harvested when they are green and grilled or roasted but they also make a great pepper tempura. I found several recipes here. The pepper plant itself is small (about 12 inches or so tall, although I have heard of them growing taller) and yields a medium-heavy crop of peppers, I planted 3 plants because I wanted tons of them. I harvested once a week and usually ended up with 2-3 dozen peppers per week. These plants are remarkably drought tolerant (I only watered them once a week) and disease free. They were super easy to grow and I recommend growing them in a large pot or in a raised bed. Pepper are 2-4 inches long, Don't mind the stunted red one, it was probably not fully pollinated. 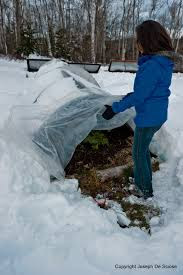 Most gardeners put their gardens to bed in the fall/winter but there is a small group who brave all sorts of conditions and garden all winter long. Maybe it's the thrill of seeing little green leaves in a sea of grey and brown that excites them or the peace and tranquility of a less busy garden and the opportunity to commune with nature; whatever the reason if there is a will, there is a way. Here in the PNW, we have had relatively mild winter the past 2-3 years. Artichoke, kale, cabbage, arugula and dahlias have overwintered in my garden 3 years in a row. I personally do not garden after October 31st because it is too cold for my fingers to operate effectively. Fall gardening poses several challenges. The water at MCGA is turned off in October so if you want water, you have to collect it at the garden via rain or lug it from home. The sun is low in the sky and we just do not get many hours of light. The weather turns cold and most plants do not tolerate the cold well at all. There are some that like cooler weather such as greens like lettuce, spinach and arugula. Plant these seeds in mid-August to early September and you will likely get a nice crop before the frost hits. 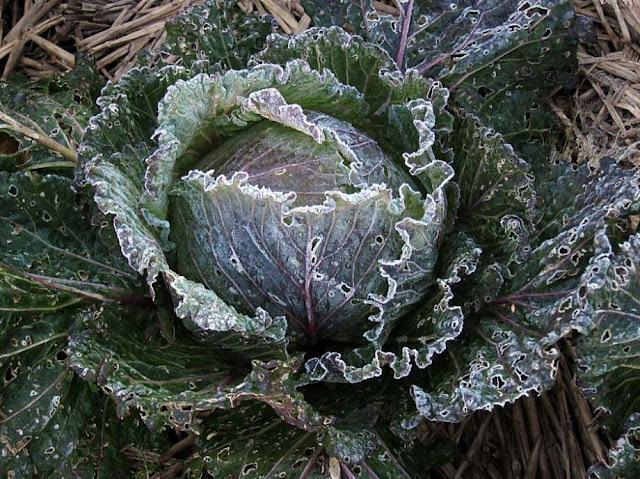 If you want to garden past the frost date you will have to take extra precautions to make sure your plants do not freeze. See below for some examples as well as their pros and cons. 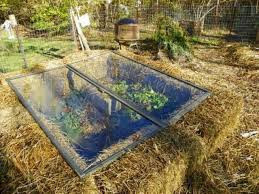 Cold frames are the best at keeping the cold out. They keep your plants very cozy and are easy to open when you need to water. 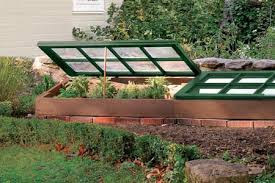 When made of glass they can get very warm so it is best to purchase a venting mechanism to open and close the lid/top when the temperature rises and falls (yes, there is such a thing.) They are heavy and usually live in one place in the garden. You can buy pre-fab kits or you can make one yourself. They are not cheap and take a bit of know how to build although I have seen some clever recycled versions. 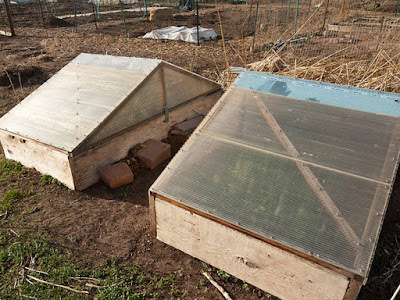 This is a hoop house, Plastic PVC pipes are bent and place in the ground then plastic or Reemay types of garden fabrics are placed over the hoops and pinned down. 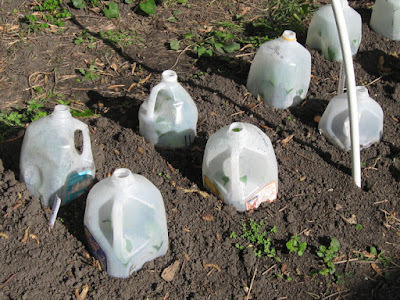 This is a super easy and cheap way to trap heat for your plants. Make sure you use the thickest plastic and fabric you can afford, the thicker the better. Plastic can heat up quickly so you have to watch out for scorching and they do not let water in. 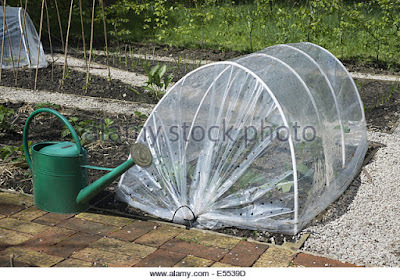 You will have to open up the hoop house to water every time. Fabrics are better, they let water and air in so problem of overheating is minimized. When selecting a winterizing covering consider is how airtight it is. The less permeable it is, the warmer the trapped air remains on cold nights. On the other hand, airtight cloches demand more attention to prevent overheating and possible death to your plants. Air tight coverings also do not let water in. Consider also the material from which the covering is made and its durability. Lightweight plastics may last only a year or two but thicker plastics, especially if the plastic has been treated with ultraviolet light inhibitors, might last 5 years or more. Glass lasts forever if it doesn't crack first. Finally, consider what you'll do with the coverings when they're not in use. Do you have the room to store everything when summer hits? Ponder these thoughts as you plan your next season, see you next spring. Step 1: Start putting your garden to bed by harvesting your ripe produce. 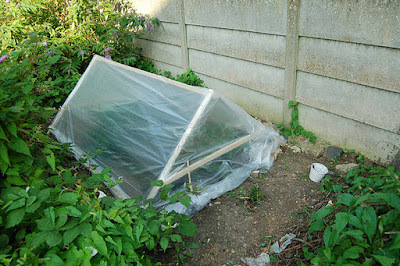 Many "hot" plants like tomatoes, cucumbers, peppers and eggplants will continue to produce fruits until frost. Pinch off new growth and flowers because at this point they will not end up forming fruits, you want to concentrate the energy the plant has into ripening what is already growing. Step 2: Pull all weeds, grass and clean up garden debris. This helps to reduce pathogens and pests in your garden. 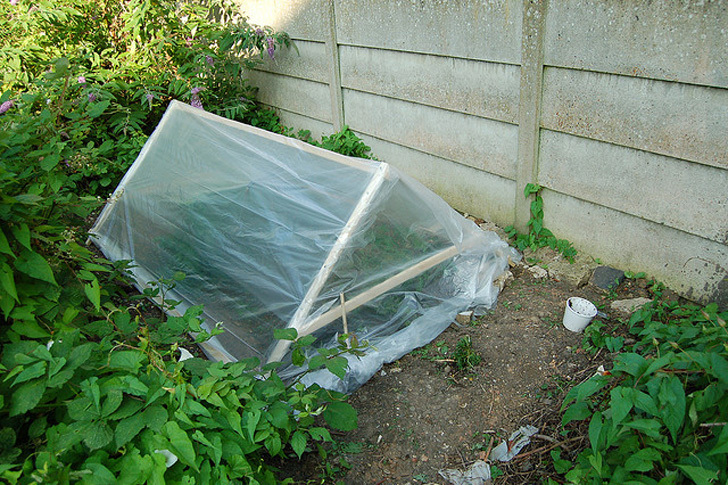 If you had blight, powdery mildew or any other issues in your garden this year, remove all infected plants from your garden ASAP. 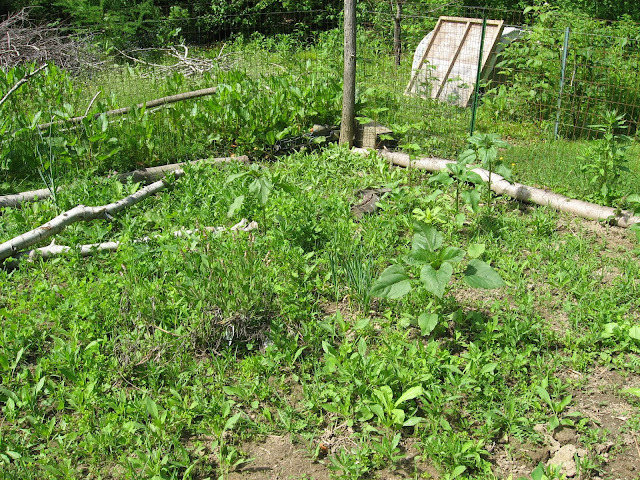 Don't put your garden to bed looking like this! 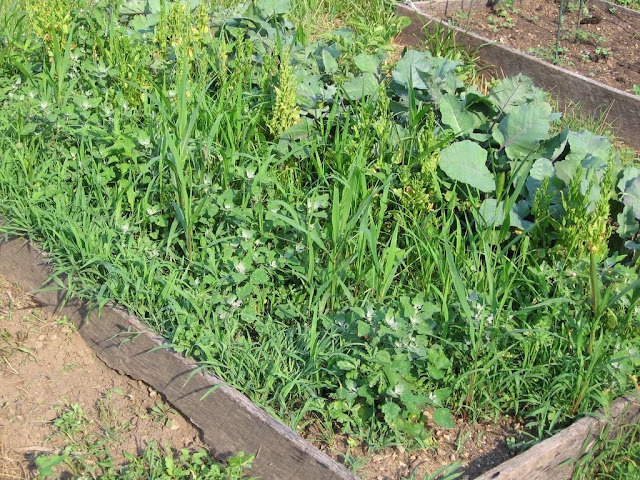 Step 3: When your crops have stopped producing, pull them up and put them in the clean green pile. No wire, plastic or string in the clean green please. 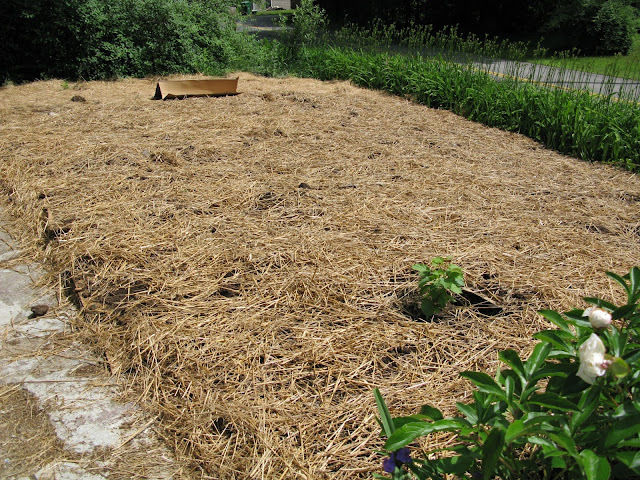 Step 4: Next, mulch your empty garden bed/plot with some nice organic matter. Leaves, straw, cardboard, newspaper, compost or burlap will do nicely. Lay the mulch on as thickly as you can 2-6 inches is ideal. 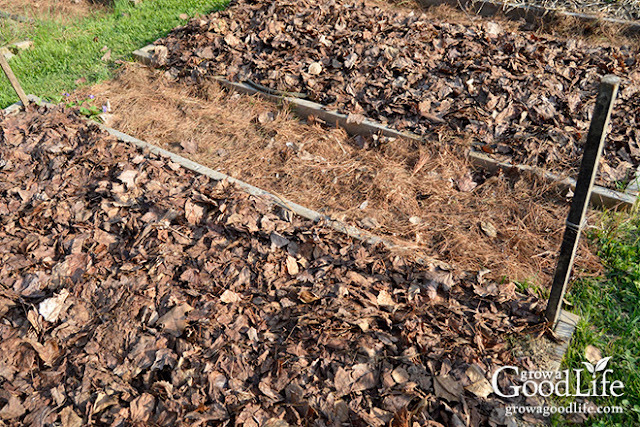 (We do not recommend wood chips, as they decompose they strip nitrogen from the soil.) 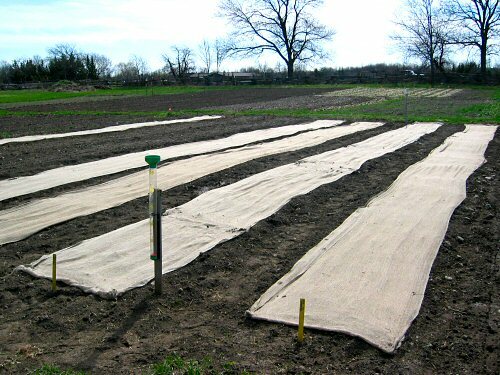 Thick black plastic will do as well, although it is not organic and when it heats up, it will kill beneficial microorganisms in the soil. Step 5: Relax and enjoy your winter. Spend your cozy nights browsing through seed catalogs and the like. When the spring comes, all you have to do is remove the mulch (I NEVER get rid of any organic mulch, I simply push the stuff into my paths) and plant. 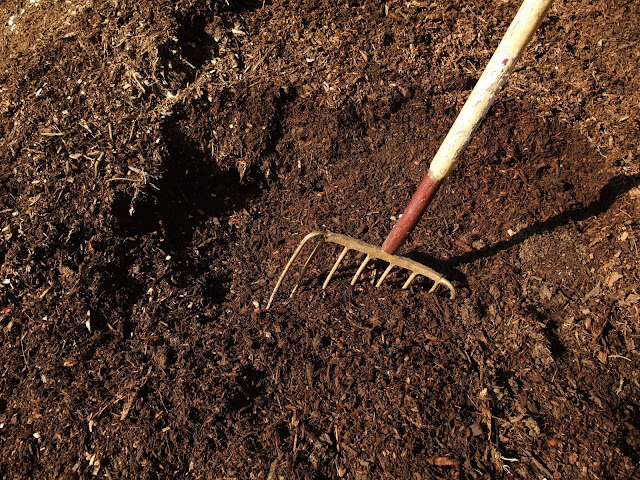 Your soil will be weed free and ready to receive your starts or seeds. We hope you have had a fruitful and "vegetative-ful" year gardening with MCGA, see you next spring!